One of the main scopes of i3 activity is to help projects to get to the market. 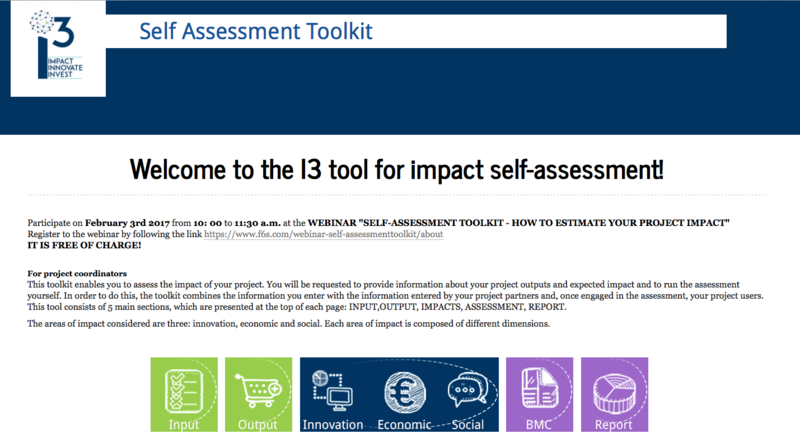 Following its mission i3 team has created an online Self-Assessment Toolkit ( toolkit.i3project.eu/toolkit/) that enable projects to validate their outcome in terms of Socio-Economic and Technological impacts. The tool was created by using Innovation Radar and Business Model Canvas methodologies. The toolkit gives a unique opportunity to the projects not only to assess their outcome results but also to design effective business models. The aim of the webinar is to explore together with i3 team the benefits that Self-Assessment Toolkit can provide to the projects and its added value. Do not miss the chance to make your business better!